“Elena of Avalor: Song of the Sirenas” is a television movie that is going to be in prime time on Disney Junior on Friday, September 21st and we are super excited. This movie is going to have a superb cast with Gina Rodriguez, Edward James Olmos, Rita Moreno, Prince Royce, Rosario Dawson and Javier Muñoz. Both of the sirenas, that are mysterious underwater creatures will be played by Prince Royce and Rosario Dawson. We also get Duke Cristóbal, who is Elena’s cousin that is the role that Javier Muñoz has for the movie. 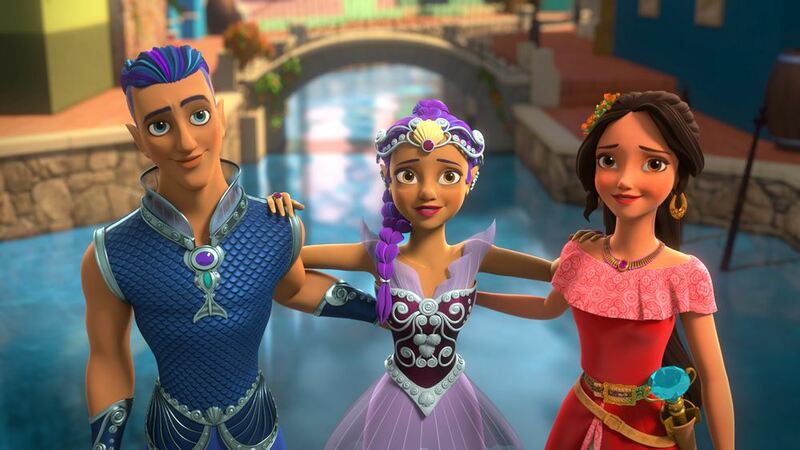 ELENA OF AVALOR – “Song of the Sirenas” – While visiting her cousin who lives along the coast of Avalor, Elena encounters a group of mermaid-like sea creatures called sirenas and learns about their complicated history with humans. In an attempt to make amends, Elena befriends the sirenas and enlists their help to defeat evil sorceress Shuriki. This episode of “Elena of Avalor” airs Friday, September 21 (7:00 – 8:00 P.M. EDT) on Disney Channel. The overall story has Elena travelling to Nueva Vista to meet up with Duke Cristóbal. While she is visiting she discovers the mermaid-like sea creatures, the sirenas. While there she learns about the history between these creatures and the humans, which has not been all that pretty. Elena befriends the creatures and tries to have them help her defeat Shuriki, the evil sorceress. The cool thing is following the movie, Disney Junior is going to show a bunch of shorts that will give us some more insight to the sirenas. They will be called “Elena of Avalor: The Secret Life of Sirenas” and there is a book as well. Now that Sofia The First is over, Elena is our favorite princess that is still on the air.